Mr Panda’s books are great for introducing toddlers and young children to the concept of manners. 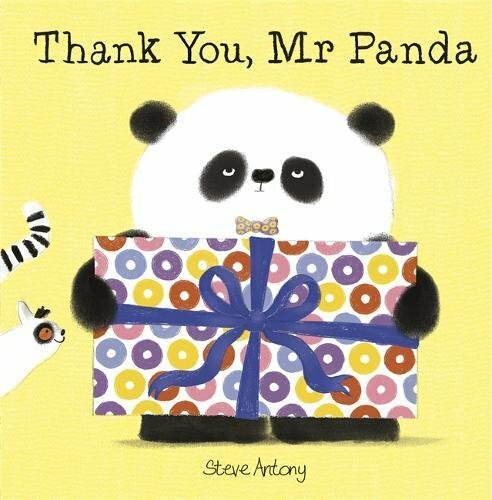 In Thank You, Mr Panda, several characters are quick to point out that their presents aren’t quite right but are gently reminded that ‘it’s the thought that counts’. The Story: Mr Panda has presents for all his friends and goes to great lengths to deliver them. The presents aren’t always quite right but as the lemur says ‘it’s the thought that counts’. Then the lemur gets his present! Thank You, Mr Panda introduces children to several animal characters, some more familiar than others. The lemur from Please, Mr Panda is back to help with present giving and he’s the only animal who says thank you, we like his present the best! Mr Panda is famous for his doughnuts, the presents are all wrapped in doughnut paper and the same pattern is on the presents that the animals find inside. One of them has real doughnuts inside his present! Mr Panda is a serious character, we only counted one smile right at the end of the book, but his heart is definitely in the right place. Accompanied by the lemur he flies in a hot air balloon and dives into the sea to deliver two of the presents. We love the underwater spread with the lemur wearing his swimming ring! The presents add colour to the illustrations which are predominantly black, grey and white on a yellow background, the simplicity of the style is perfect for a young child. Thank You, Mr Panda would make a great addition to a library in a nursery or early years classroom. Told entirely in dialogue it’s a lovely book to stimulate conversation about the correct response to receiving a gift. You could ask children what kind of presents they would give to each character or to their best friend or a parent. The theme of giving to your friends also makes this a good book to include in a topic on friendship. We were very excited to win Thank You, Mr Panda in a Twitter giveaway. Thank you very much, Mr Antony! Hi Catherine, this book sounds great for teaching children manners without lecturing them. Manners cost nothing but count for a lot. My toes do curl when I see a child given something and don’t hear a thank you. This sounds lovely for introducing the concept of manners and I’m a sucker for a panda! One for the tiny nephews, I think! I love Pandas too, they tend to get sidelined in favour of other bears! I agree, it can really change the way that you interact with somebody if you even just say please and thank you. It’s a lovely story and shows children how to say thank you in a subtle way without being too moralistic. I don’t like it when a book is overly moralistic but when a subject is covered more subtly it can be really effective. That’s a very cute panda on the front of the book there! We’re very strict on manners here. Mr Panda is strict on manners too! This looks like a lovely story book! We love books in this house and Mia has a massive collection however we haven’t got this one and I haven’t heard of it either. Stories like this are perfect for bedtimes. The Mr Panda stories are lovely for younger readers. They have such bold and bright illustrations to go with the simple text.